Ms. Celiac Says...: The Latest From Enjoy Life! Enjoy Life has long been one of my favorite brands - I am absolutely addicted to their gluten free and dairy free chocolate products! They have always sold an assortment of gluten free soft baked cookies but now they are releasing a line of gluten free CRUNCHY cookies! They recently sent me samples of each variety and I can assure you that they are all delicious! In addition to being gluten free, they are allergen-friendly and are free of the top 8 allergens (wheat, dairy, peanuts, tree nuts, egg, soy, fish and shellfish). 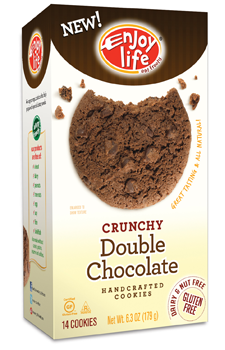 They are also made without any artificial ingredients and contain no trans fats! Enjoy Life products are available in natural food stores and conventional grocery stores throughout the United States and Canada. You may also purchase them at Ms. Celiac's Market!